complicated enough, Merry just had to be different! We booked him into Cotts Farm Equine hospital and set off – having starved him for 36 hours (I know I have told you that before, but honestly, it’s a bit extreme!). He was pretty scared at hospital, what with having to go there on his own and everything. But they are very understanding at Cotts and he soon felt at home. When it was time to collect him, Richard had a long face and said ‘I’m afraid it’s not straightforward’. Although the scan looked as though there was a small, shadowy thing lurking up towards Merry’s tummy region, it turned out not to be the second testicle. Richard said we would have to do blood tests in a few days to see whether he was a gelding or not, so we took him home again. 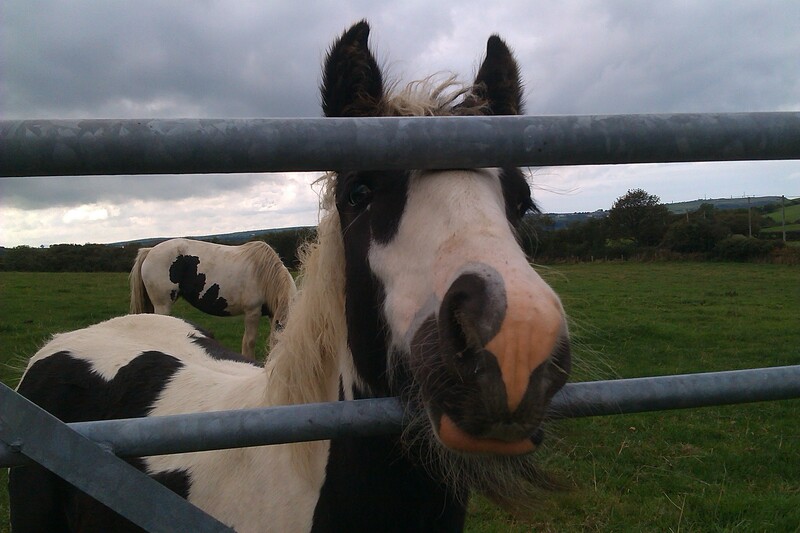 He recovered really well from his operation and, thank goodness, the blood tests showed he was a gelding. It seems that someone (and that someone was clearly not a vet) had had a go at Merry before – poor little man! Anyway, all’s well that ends well, as someone once said (perhaps it was me) and Merry is settling into his new life as a gelding. 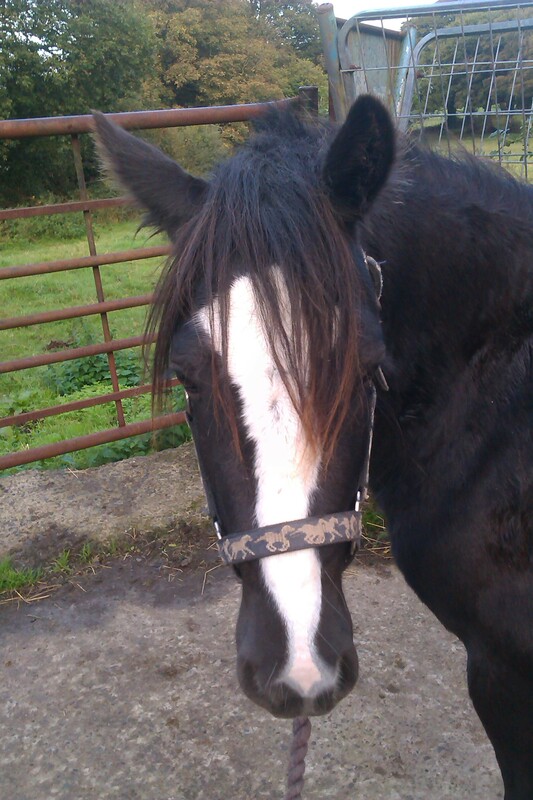 And although he was scared that day, he is a much more confident pony now. This year, all of the colts here have been the lucky recipients of a grant from the Pettifor Trust. It has provided them with the veterinary care that they need to put them on a safe path to a new life. The Pettifor Trust is based in Swansea and was generous in its help to these ‘Swansea Jacks’. Diolch yn fawr iawn i chi! 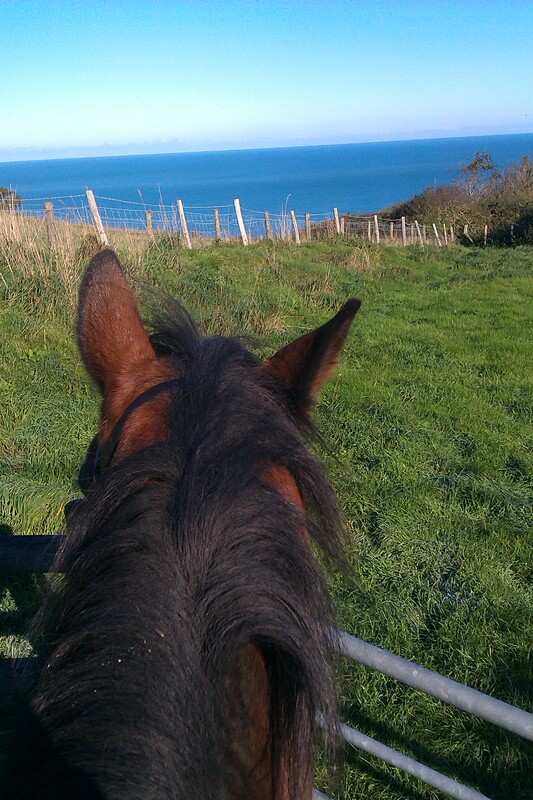 This entry was posted in Hints on horse care, Horse welfare, Life and Times and tagged Pettifor Trust on October 23, 2013 by sallylearoyd. being a boy. This year,we have had a bit of a glut of these young lads on the yard. They get neglected because nobody wants to get them gelded and feed them until they are three. So sometimes they end up struggling and starving. Once they are healthy, it’s no problem getting them fat – you rarely have to teach a hungry pony how to eat! But if a young boy is to find a good, settled home, he needs to be a gelding. We have a great vet whose name starts with V. She sorts us all out and helps us when we are sick. We have a ‘hospital wing’ at the yard where she does the gelding operations. It’s just a clean corner of a well-lit shed, with rubber matting and a thick bed, where she can work in fairly clean and controlled conditions. 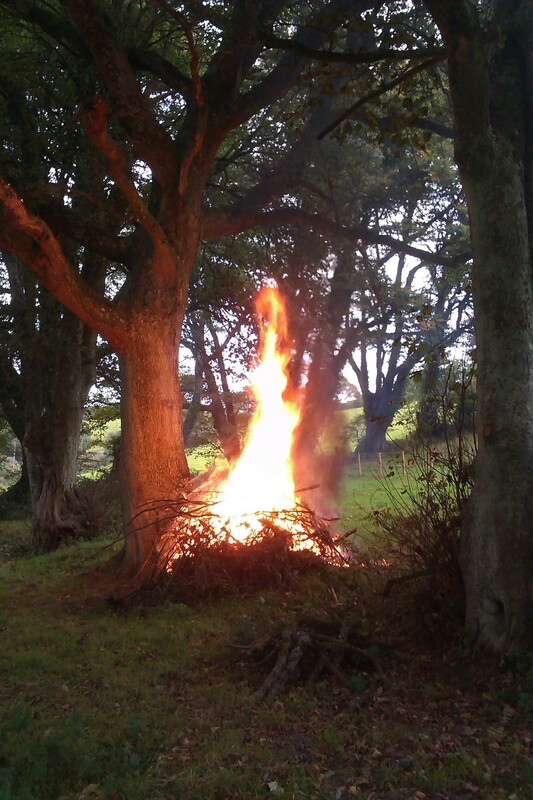 We organised a day and booked for the Hobbits to be done – I make myself scarce to be honest. I was done years ago but the thought still makes me wince! Bilbo was up first, catheter in neck, drugs all injected in; Bilbo still awake. Bit more drugs, Bilbo still awake! Tiny bit more drugs (uh oh, can’t have any more) and Bilbo lay down. All is settled, everything washed and ready for the unkindest cut, when surprise! Bilbo gets up again! Back to the drawing board for him then. We booked for V to come another day. She sedated Bilbo with some different stuff and he was was done while he stood up. Although he looked awake, he didn’t seem to know a thing about it – amazing! Next up is Frodo, who goes to sleep as planned, All is done and dusted and he’s back on his feet before we know it. He’s a bit sleepy, but V has given him lovely pain relief so he is not distressed. 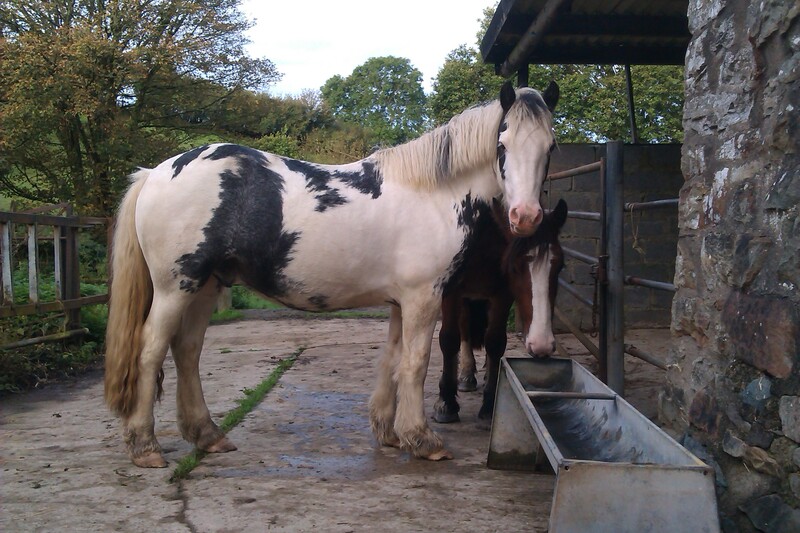 After the rest of the day, he is able to go out into a lovely clean field with Bilbo – to sleep it off. Merry was a different story altogether. He got examined (which he rather enjoyed) and V said he would have to go to hospital. That turned out to be quite an adventure! 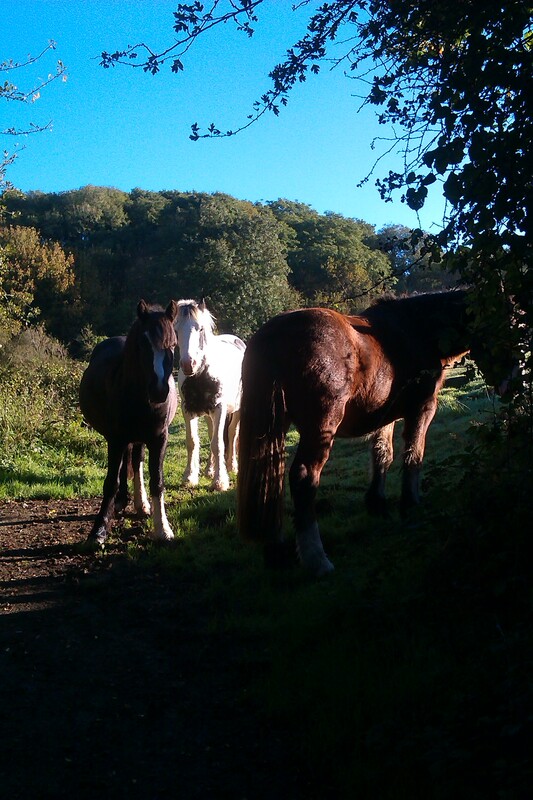 This entry was posted in Hints on horse care, Horse welfare, Life and Times and tagged horses and ponies on October 22, 2013 by sallylearoyd. Where the sunshine has gone please? Yesterday was a brilliant day; warm, bright and endless. When the hobbits came in for breakfast I could hardly see them for the sun in my eyes. Later she took Hooli and Tawny ride and lead and they came back very tired but quite content. They had also taken a photo on the way – I ask you, what an effort, you can’t get the staff! I was out in the field with Tawny and Hooligan and I didn’t come in until quite late. There isn’t much to eat there, but I have to watch my figure, like all of the permanent residents here. We are all well nourished and cared for – it’s the poorly ones who get all the grass. I understand all this, because I was once very poorly myself, but Tawny does get a bit waspish about the whole diet thing. Later, she got busy having bonfires and collecting firewood. Fine autumn days seem to take her that way. She is muttering about the harness room as well. We need so much stuff! There is no telling what size the next poorly horse will be, so every rug gets kept, just in case. Anyway, that was yesterday. Today the rain is biblical and I would like the sunshine back again please. This entry was posted in Life and Times on October 16, 2013 by sallylearoyd. Is this a charity issue? It’s not a new situation; we have all seen this news before. The difference is the numbers involved – and the time of year. These poor creatures are ailing and dying on a warm October day – what hope for them and their kind when the cold weather begins to bite? And if the charities are forced to use their resources now, what hope for all those other ponies and horses, which fall upon hard times – as I did – during the winter? It’s ironic to me that this is happening in the same week as the Horse of the Year Show. Over in Birmingham, there are the top flight, swanky boys, winning prizes worth a fortune – and here in Wales these poor things are dropping dead for want (probably) of a worm dose, some supplementary feed and a bit of basic management. 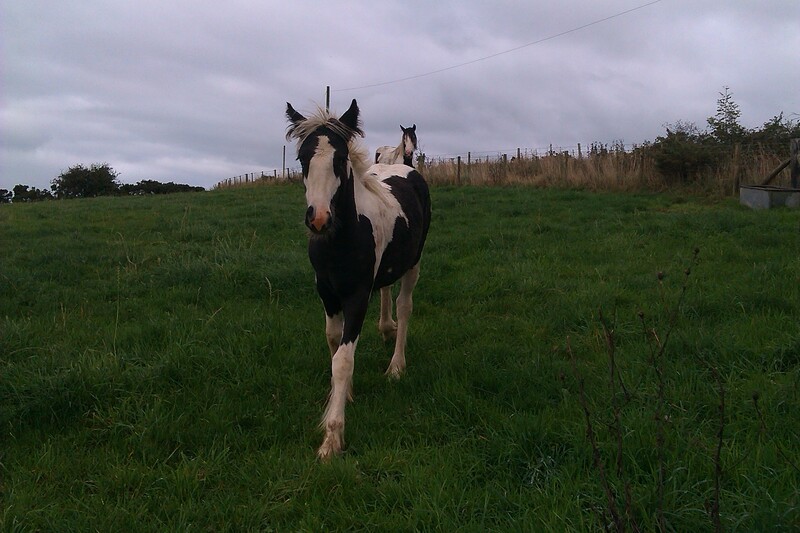 These horses are not worth a great deal – there are so many coloured cobs about that their owner probably doesn’t care whether they live or die. How can the horse industry allow this to happen? 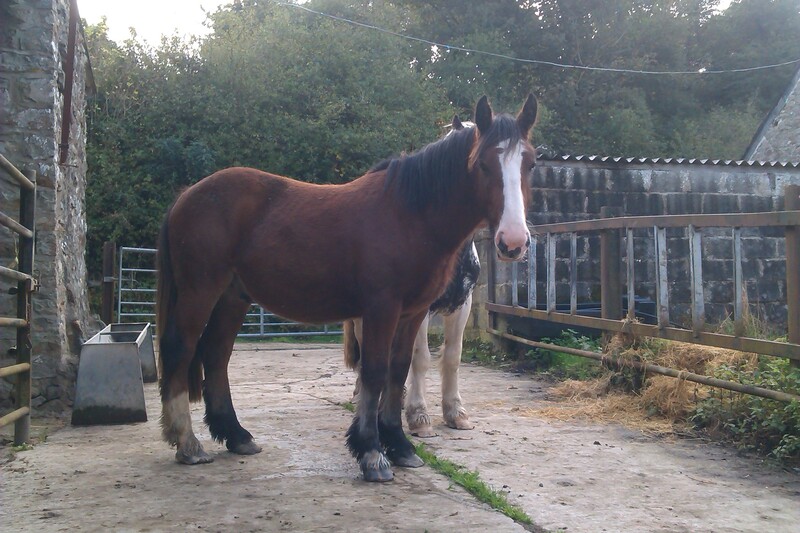 This entry was posted in Horse welfare and tagged Charitable organization, Horse, Horse of the Year Show, horse welfare, NEWC, Redwings, Royal Society for the Prevention of Cruelty to Animals, South Wales, Wales on October 11, 2013 by sallylearoyd. Well, Veronika was not long getting back to us with the result of Hari’s snot swab. It wasn’t strangles (hooray) but another strep infection which is a bit messy, but shouldn’t make her too ill. I am very pleased about this. I have not been allowed to meet her yet, but I think we shall be friends. She does have to be isolated from all of us for the next 28 days (! ), but, the lucky girl, she happens to be with her Mum in a field miles from any of us anyway! So she gets to stay there, eating the grass and enjoying the autumn sunshine until Veronika (my vet) says she is not infectious any more. This entry was posted in Hints on horse care, Horse welfare, Life and Times and tagged Conditions and Diseases, Hari, Health, horse welfare, Infectious Diseases, Strangles on October 11, 2013 by sallylearoyd. It’s been a bit hectic this week. There have been lots of changes of field and stable and I think everyone has landed now. 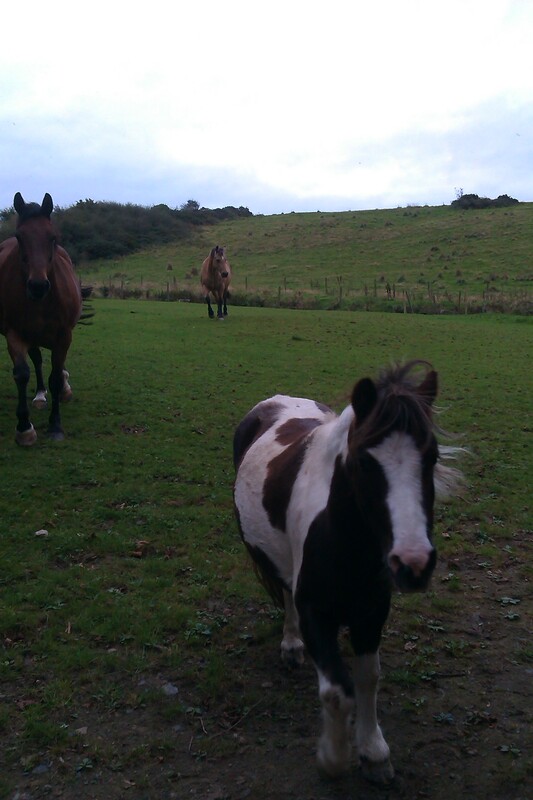 Hooligan is back with Tawny, ready to start work again and Tabitha and Twinkle are in a flattish paddock behind the yard. Tabitha is still taking it easy while her sidebone settles. On Monday, Merry was brought in to the stable beside mine and he didn’t have anything to eat until Thursday – 36 hours with no grub! I was sympathetic – I would not have been happy with that arrangement. Anyway, on Thursday the trailer was hitched up, I got extremely excited, because the trailer sometimes takes me for a day out, to see my public, but no. This time Merry was loaded up – and he was very good about it too. Then he went off to Cotts Farm Equine hospital to have his operation. Apparently it couldn’t be done at home like the others, because of certain stuff (it makes my eyes water thinking about it), so he had to go and have a scan first. He got back about 4 pm and he was a bit sleepy, but eating as though his life depended on it. He had to starve in case the anaesthetic gave him a guts ache – poor little man. Anyway, by evening he was pretty lively again and Friday afternoon he went out with his mates again. He has to have a blood test in ten days to make sure it’s all OK. In the meantime he is eating up his meds which he has in a (large) feed each day. Now it’s me who is feeling hungry! 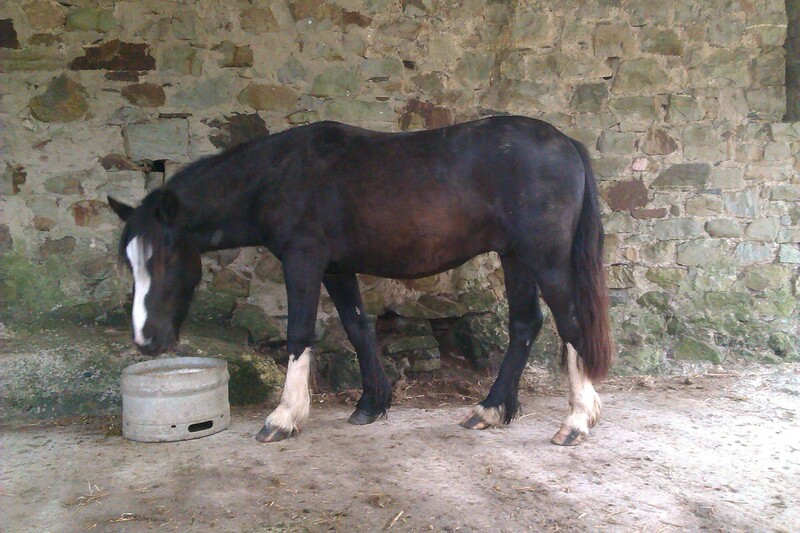 This entry was posted in Hints on horse care, Horse welfare, Life and Times and tagged Cotts Farm, horse welfare, horses and ponies, Pony Power, rehabilitation livery on October 6, 2013 by sallylearoyd.